The Internet Chess Club is excited to announce its new monthly tournament with cash prizes. 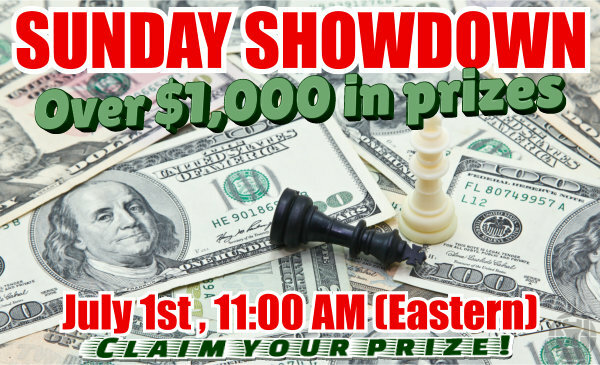 To be played on the first Sunday of each month, we'll host our first Sunday Showdown cash prize tournament on July 1, 11:00 AM (EST) - BLITZ 3 0 NINE ROUNDS. We'll offer cash prizes for the top finishers, as well as ICC membership time and video series giveaways for class winners! From each ICC First Sunday Showdown tournament grid, 12 players will be randomly chosen for a 3-month membership. If a player already won a cash prize, he/she is not eligible for a random draw prize. If a cash winning player’s number is Randomly drawn, another player will then be chosen. All Random Draw Winners will be announced directly at the completion of each ICC First Sunday Showdown.